Masonry Heaters: Designing, Building and Living with a Piece of the Sun. 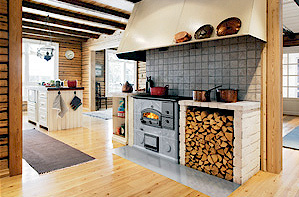 Tulikivi, based in Finland, is the world's largest manufacturer of heat retaining fireplaces. Fountainhead Natural Homes is proud to be an authorized Tulikivi dealer. Today, many recognize hearth to mean “fireplace”. And, indeed, the hearth literally is the floor of a fireplace. Unfortunately, this bland definition of a hearth turns the fireplace into just another option for a house. “ Should we put in a fireplace? Do we really need one? Well, it adds value to the home and it might be nice to enjoy a fire once-in-a-while so let’s put one in.” And so the architect slaps a fireplace onto the outside wall of the living room. “There,” he says, “is your fireplace.” Thus, this much misunderstood item appears on so many floorplans with no more and perhaps even less thought than a trash compactor or dishwasher. Then, as the homeowners find that the cold, outside wall chimney makes fires hard to start and sends thick, odorous smoke backdrafting into the home, it falls eventually into disuse or perhaps is converted to a gas fireplace. So now the homeowner can turn on his fire just like he turns on the T.V. Ah! Yet another way to escape from reality! This is, after all, how the place of fire became the hearth. For thousands of years, if there was no fire, there was no family, no togetherness, no home. And conversely, where there was a fire, all these things unfurled, like the petals of a flower touched by the warm rays of the sun. We are introducing the hearth back to its rightful place: In the center of the home and, even more importantly, as the basis for the home. The hearth is the reason to build the home, not the other way around. We build the house to protect the hearth, for it becomes the vital center of the home. The hearth is where life in the household unfolds. Imagine the scene. . .
Dad is loading chunks of wood into the firebox. Mom pretends to not notice his sinewy muscles as he grabs a slab to set on the last. She’s pouring another glass of wine for Uncle Charlie who’s sitting on the bench next to the bakeoven. It hasn’t become apparent yet that he is dozing, sitting up, on the bench next to the bakeoven, bathed in the gentle heat of the stone. Fuzzy, the calico, has found her way to the top of the stove. It appears she’s looking down at her reflection in Uncle Charlie’s bald head. Davey and Tina, the youngest, and twins, sit on the bench next to where Dad busily builds the fire. They munch on freshly baked pizza while playing Slapjack on the polished bench slabs. Dad stops to watch Mom laugh when she notices Uncle Charlie’s subconscious state. Dad remembers how that laugh was one of the first things that brought them together. Meanwhile, Grandpa is shaping his “world-famous” nutbread on the pastry board, aware that, after another hour-and-a-half, the bread will have again risen to twice its size and be ready for the stone oven, which by then will be at perfect bread-baking temperature. He’s grateful there’s room for four large boules, for the first will no doubt disappear shortly after it cools. Aunt Rita is enjoying her wine from the easy chair that she positioned just right so she’ll be able to watch the blazing fire, the kids playing, and still be able to talk to Mom and Grandpa. Rose, the teenage sister, just back from the movies, goes to help Grandpa with the bread. He claims she has a knack for baking. . . . The news is telling us that people are spending more time than ever at home with family. A masonry heater complex in the middle of the home is such a source of comfort, serenity, and life that it pulls the whole family together. It’s the nerve center where cooking and baking nourish our bodies at the same time that interaction nourishes our soul. The T.V. doesn’t do it. The sound system doesn’t do it. A forced air furnace can’t do it. These things urge us to disperse, disconnect. The masonry stove at the center of the home is the starting point for something much greater than just a fire or lower utility bills. It challenges us to talk, laugh, eat, drink, and be human; to notice each other, listen, and feel! So if you are planning to build, start with the heart and build out from there. A masonry heater complex can include a heater, a separate bakeoven, masonry cookstove, and large areas of heated sitting benches and wood storage. Or it can be as simple as a single heater. A masonry stove, or masonry heater, is a heat storage fireplace. It works on the principle of burning a hot, relatively fast fire, and providing a means for the heat of the fire to be stored in the masonry mass. The firewood is permitted to burn to ashes. The heat from the fire then radiates gently but persistently for 12 to 24 hours after the fire goes out. Perhaps the point most difficult to convey is that the fire is not continuously stoked and kept burning. For it is the stored heat that will keep the house warm! 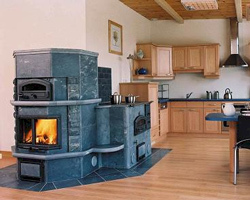 Masonry stoves have been in continuous use in Europe for literally hundreds of years. In the old country, wood use in the 18th and 19th centuries was incredible! Wood was used not only as the primary building material, but also as the primary fuel for cooking and heating homes and businesses. This had been the case for many centuries as 1800 came near. So it is no wonder that folks began looking for ways to make their fuel last longer. So clever engineers and craftsman of the time found an answer that is simplicity itself. Instead of letting the hot gases of the fire go up the chimney and out of the house, trap them for as long as possible in a maze of wandering flue passages. The residence time of the exhaust within the mass of the fireplace allows the heat to be soaked into the masonry of the fireplace. Thus the exhaust that finally exits the home is relatively cool and the heat of the fire is kept. The stored heat slowly and evenly emanates from the masonry, like a miniature sun, into the house. One of the many unique attributes of a masonry stove is that it burns so cleanly. With a properly used masonry heater, creosote is non-existent. The reason for this is the high combustion temperatures reached in the masonry core of the stove. When wood burns at temperatures in excess of 1100º F., virtually everything that can be burned is consumed. Thick, black soot and creosote do not survive these temperatures. In a masonry stove, temperatures of 1400º-1800ºF. are not uncommon within the secondary combustion chamber. Thus it is that a masonry stove uses less fuel and produces much less pollution than a typical woodstove or open fireplace. The creosote and tar deposits of a typical stove are just more fuel for a masonry heater. We have observed wood usage from three to six times less than a woodstove for heating a similar amount of living space! Because of the extremely low emissions, a masonry heater is an environmentally sane way of using wood as a fuel. Burning wood in a masonry stove does not result to a net increase in greenhouse gases. It can truly be said that the environmental effects of properly burning wood in a masonry stove is the equivalent of allowing wood to naturally rot on the forest floor! All of this and much more is covered in the new book, "Masonry Heaters: Designing, Building, and Living with a Piece of the Sun" by Masonry Heater Store founder Ken Matesz. Order your copy today. Just click the PayPal button on the left column on this page.